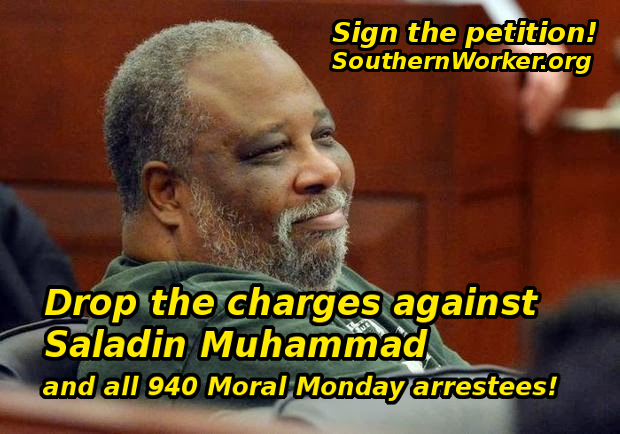 Petition to Stop the Criminalization of the Right to Protest: Drop Charges Against Saladin Muhammad and Moral Mondays Labor Rights Arrestees! Tell North Carolina’s Governor, Legislature and District courts and Pres. Obama to stop attacks on the constitutional and international human right to protest!! Fill in the form below to send a message to North Carolina’s Governor, Legislature and District courts and Pres. Obama to stop attacks on the constitutional and international human right to protest! (scroll down below the form to see the text). I am writing you to demand that you stop the attacks on our Constitutional rights to petition and protest the government. I am concerned about the conviction of Saladin Muhammad and the prosecution of all the 940 Moral Monday campaign arrestees. These courageous people were standing against the move to enact anti-worker and racist laws as part of a national corporate financed campaign to eliminate vital social programs and basic democratic rights. Muhammad, a founding member of Black Workers For Justice, led the organizing as an Organizer of the national United Electrical Workers Union (UE). and the North Carolina Public Service Workers Union-UE Local 150. UE Local 150 has been a leader in the campaign to repeal the North Carolina state ban on collective bargaining rights for public sector workers. 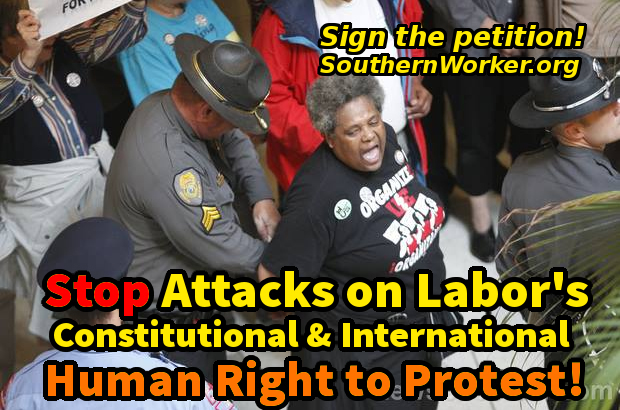 This campaign included getting a ruling from the United Nations International Labor Organization (ILO) finding North Carolina and the U.S. out of compliance with international laws and treaties by its denial of public sector workers collective bargaining rights. Despite the ILO ruling, North Carolina and the U.S. have refused to comply. Muhammad and other UE local 150 leaders were denied meetings and ignored by state legislators several times before engaging in civil disobedience. The North Carolina legislature is now pushing to get its anti-labor right-to-work law as an amendment in the North Carolina State Constitution, banning the right to collective bargaining for public sector workers, and preventing private sector workers from using card check in efforts to form unions.